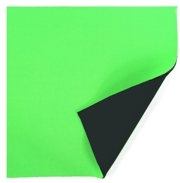 This sheet of Neoprene is high quality and is double lined with stretch polyester on both sides. This type of lining is sometimes known as double lined or Polyester/Polyester. This product is green on one side and black on the other.